The following course-subjects each have a duration of 30 hours. These drawing classes in Dubai include examination and evaluation as requirements for course completion. However, students may choose for open-training instead, which will allow them to complete these drawing classes in Dubai without examination and evaluation. The course combines theory and practical work throughout the duration of the drawing classes in Dubai. 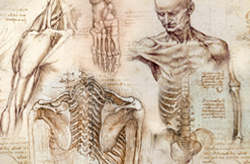 This course will introduce students to basic human anatomy and the various qualities of the human form in a variety of ways using a range of materials. Quick poses or ‘gesture’ drawings will be used to introduce students to the general principles of shape, form and proportion, followed by longer poses with greater detail and clarity. Once mastered, the use of figure drawing can be applied to fine art, illustration and cartooning. Students will undertake a wide variety of exercises studying aspects such as proportion, movement and portraiture. 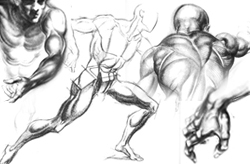 This course will continue building upon the foundations of drawing, including tone, line, shape, and pattern, through observation of the human figure. It will provide various approaches and techniques in order to further stimulate and challenge. Students will be introduced to the human anatomy and expressive qualities of the human life form. They also develop sensitivity to the structure, anatomy and expressive qualities of the human form in a variety of ways and with using various materials. Composition will be a consideration at all times. The course combines theory and practical work to understand the skeletal foundation of the feet and hands, including proportion and measurement. 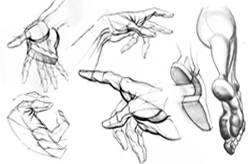 The drawing classes in Dubai for this course subject will deal mainly with practicing gestures and the movement of the feet and hands. Practicing in gesture and movement of feet and hands. 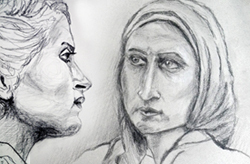 The course combines theory and practical work to promote a deeper understanding of how to draw a portrait. The classes will introduce the history of portrait drawing, from the very beginning to the present styles. It will focus on the structure and anatomy of a portrait, including the head, neck and shoulder. The drawing classes will focus on achieving accurate measurements of features. The study course will focus on the realistic portrayal of human physical attributes with respect to fundamental physical aspects such as skulls, bones, and proportion. Students will also be focusing on likeness, personality, and mood of person. Charcoal is one of the fastest media. Additionally, it is one of the least inhibiting media. It can produce bold and fluid lines, and a great host of textures as well as subtle gradations for shadings. Conte, on the other hand, is an attractive and versatile medium, which allows for both line and tone work. In this course, students will be taught how to utilize the versatility of the said media in order to create still life from the observation. In this course study, Dubai students will be taught how to utilize the versatility of charcoal and conte in order to create landscape. Students will be guided on how to best make use of the visual capabilities of said media in order to develop textures and shades, and create accurate depictions of landscapes. Soft pastels are best for broad, painterly effects made with the side of the stick. 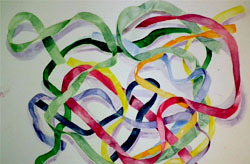 This allows the artist to exploit both line and soft color areas. Very light blender is used for soft pastels, which are almost pure pigment. Students in Dubai will be guided on how to best make use of the visual capabilities of said media in order to produce still life, landscape, and portrait creations through the observation. 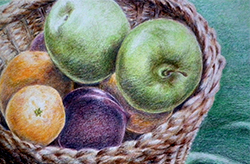 Colored pencils are basically line media, but solid color and considerable depth of tone can be achieved by overlaying linear marks, using traditional hatching, crosshatching, and shading methods. 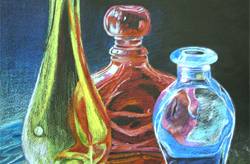 In this study course, students will be trained how to make use of the versatile pencil form and the wide variety of colors for creative expression. Through our drawing classes in Dubai for this subject course, students will be made more adept in using this media to create clean and crisp results through the observation. In this study course, students will undertake a range of experimental exercises in which they will test a range of brushes, pens, inks and surfaces. They will use the skills acquired to then produce drawings of various subject matter aimed at achieving greater levels of skill and competence. 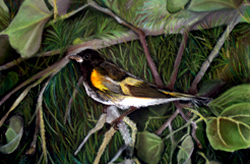 In oil pastels, the pigment is bound with oil, which creates a dense and greasy texture. The choice of colors is slightly restricted, but it is one of the best media to work with, since it doesn’t require fixing. 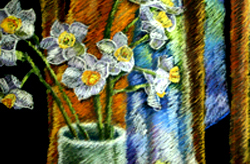 Layers of color can be built up with oil pastel in the same way as for soft past pastels and colored pencils. In our drawing classes in Dubai, students will be guided on how to properly utilize this kind of media to produce still life, landscape, and portrait creations through observation. In these single title courses, students will undergo 20 hours’ worth of training on course specific-subjects. Furthermore, course participants may choose to go through examination and evaluation to receive a certificate of completion; or forego the examination and evaluation to be given an attendance certificate. 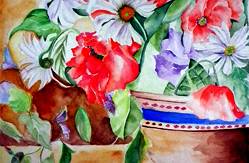 In this course subject, students may choose between learning how to use water colour for reproduction still life or landscape . They will also be introduced to the different techniques of watercolor painting, such as wet in wet, dry brush, and washes and glazes. Students will also be guided in using different kinds of papers, brushes and tools. 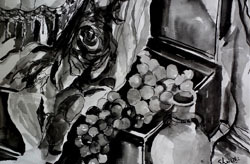 Through our drawing classes in Dubai specifically designed for this medium, students will be guided on how to produce a range of drawing experiments using charcoal to create expressive, tonal and textural marks. They will then use these skills to produce a range of drawings by reproduction. Soft pastels are best for broad, painterly effects made with the side of the stick. This allows the artist to exploit both line and soft color areas. Very light blender is used for soft pastels, which are almost pure pigment. 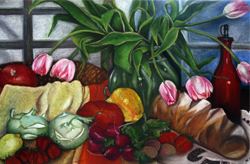 Classes will be focused on guiding students on how to best make use of the visual capabilities of said media in order to reproduction still life or landscape. 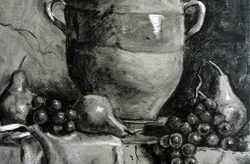 Taking skills taught in basic drawing and introducing students to a wide range of techniques and art media primarily used in monochrome drawing. 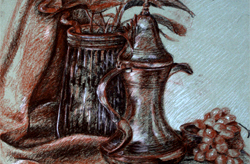 This course will involve still life, portrait and landscape drawing, helping students to accurately represent proportional objects, planes and volumes, developing strong hand-eye coordination. 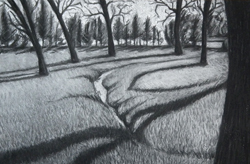 This course will develop shading, tone and line in order to develop drawing skills in monochrome drawing. 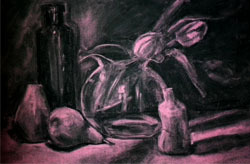 This is a studio class that emphasizes a wide range of techniques, strategies and materials to create colour drawings, with focus on colour theory and colour usage. In our drawing classes in Dubai for this subject matter, light, texture, shadow and reflection will be explored using various media, including coloured pencils, pastels and watercolours (coloured pencil – Water soluble). The classes will emphasize fundamental concepts including, line, shape, volume and proportion through observational skills. In this subject matter course, students will be taught how to arrange tones with the use of a single pencil. Dubai course participants will be guided on how to alter the pressure applied through the colour pencil to achieve lighter and darker tones. 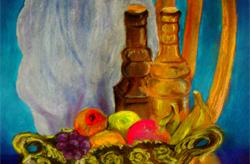 Additionally, students will be directed on how to reproducing still life or landscape.